The market clearly wants to go higher, but stay vigilant because the next dip is less likely to bounce. Look for AAPL’s weakness to persist as money managers dump shares before the end of the quarter. The market finished within 1% of a 52-week high in spite of several down-days that tried to break the market. Weekly volume was above average, not surprising given the volatility. Last week’s violation of major support at 1500 gave the market every excuse to breakdown, but rather than trigger a larger wave of panic selling, the dip ran out of supply and prices snapped back. This behavior is extremely insightful for understanding what the market is thinking. Obviously we had an initial wave of sellers crowding the exits, but no one else followed their lead and soon after the selling stopped. When the market finally bounced back, holders were rewarded for holding and sellers were humiliated for being impulsive. This strength is emboldening bulls and humbling bears. We can take two things from this. First, holders are more confident and less willing to sell because in their mind every dip bounces. This keeps supply tight, reduces volatility, and supports price increases. Second, when the market does dip again, this will be the real thing. If everyone is holding the dip, yet we are still going down, that means we ran out of buyers and the music has stopped. Stay long and look for new highs. 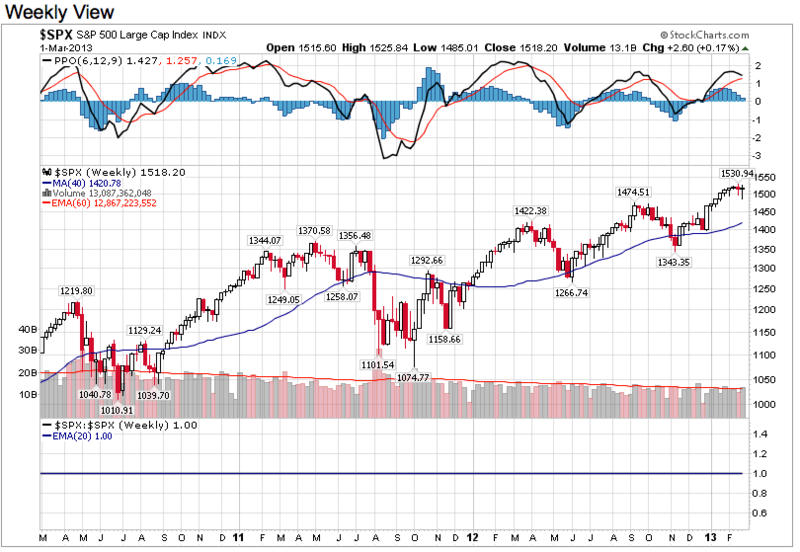 The recent shakeout refreshed the market and 1550 is expected and all time highs at 1575 is within reach. But be wary of any breakdowns because they will be less likely to bounce. Falling under 1500 shows this market lacks follow-on buying and makes for a stop-loss of last resort. If we keep making new highs, use a trailing stop to protect gains. For example, if the market hits 1540, move the stop up to 1520. Last week’s price action was extremely bullish, but there are no guarantees and the market could turn lower at any moment. Give the market some room to move around and digest recent gains, but if dip buyers fail to show up near 1500, they are not coming and we need to get out. Markets can only bounce so many times before they run out of support and break lower. The trend is higher and that is the high-probability trade, but always cover our backside. With just a few weeks left in the quarter, AAPL is running out of time to bounce and save overweight managers. When portfolio managers become convinced AAPL will not bounce back by the end of the quarter, they will sell ahead of quarter-end so they don’t look foolish being overweight AAPL. Expect this window-dressing to keep weighing on the stock in coming weeks. But what starts as window-dressing will likely devolve into wider selling as the market dips under stop-losses and flushes out holders who cannot handle any more pain. This will likely push AAPL to $400 over the next couple weeks. A steep selloff without a legitimate fundamental catalyst says the stock is finally reaching capitulation. This will be the ‘V’ bottom that finally put a floor under the stock. The lack of a fundamental driver means it is a sentiment based move and is finally showing a change in investor attitudes. But if the stock continues grinding lower, that is more worrisome because grinding bottoms are longer and deeper. The goal is extinguishing all hope and a slow grind lower means holders are still stubbornly holding on and refusing to let go. This is like pulling a band-aid, quick is usually better than slow. I receive a lot of compliments for this blog and I want to thank everyone for their support and encouragement. I created a new tab to showcase all the kind words people share and I want everyone to know how much I appreciate it. Thank you.